With machine-to-machine (M2M) communications and the Internet of Things (IoT) quickly evolving, it is critical that a foundation be built that enables applications developed on different networks and platforms to easily and seamlessly exchange information. The emerging oneM2M standard, which is developed under the direction of a consortium of eight global standards bodies, enables that exchange effectively accelerating the adoption of open M2M systems. 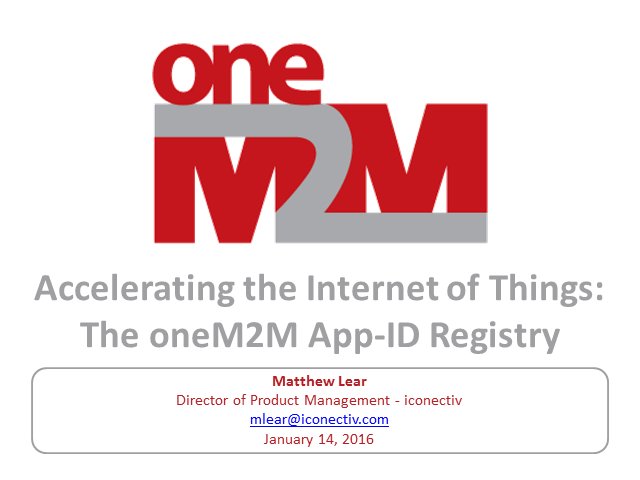 This webinar will explore how the potential of the oneM2M standard can be realized via the recently launched oneM2M App-ID registry and what developers need to do now to secure their spot in the global M2M marketplace. Matt Lear is the M2M and IoT Product Management Director for iconectiv with more than 17 years of experience in technology, business, and marketing for enterprise and consumer products. His business domain expertise includes M2M and IoT, Location-based services, network security, wireless telecommunications, and enterprise telecommunications management. Matt’s engineering background provides him a unique vantage point to bridge sales and technology processes. You will be introduced to the new features of the 3rd Release of oneM2M specifications. The importance of open standards in advancing Internet of Things (IoT) applications that use Low Power Wide Area (LPWA) networks will be discussed during a webinar hosted by oneM2M. The webinar will explore the challenges Communication Service Providers (CSPs) are facing as they look to make the most of their burgeoning IoT deployments and will examine how an open standards approach can increase cost-effectiveness, improve scalability and boost confidence that today’s IoT projects will be future-proof and provide value to the CSPs deploying them. The cross-sectorial approach to IoT taken by oneM2M is challenging when it comes to security, because IoT applications in different domains have so diverse trust assumptions and security requirements. Yet such an approach is required to deliver the information for interoperability benefits that people expect from the IoT. As a oneM2M Partner focusing on security, GlobalPlatform develops a range of security technologies addressing the challenges of complex ecosystems that find applications in different domains, from financial services to telecom networks, government services or public transport systems. The webinar intends to illustrate how the know-how and expertise of both organizations complement each other to combine security and ubiquity in IoT deployments. The end game with IoT is to securely monetize the vast treasure trove of IoT-generated data to deliver value to enterprise applications, whether by enabling new revenue streams, reducing costs, or improving customer experience. Built on top of the oneM2M architecture, the HPE Universal IoT Platform enables this data monetization. Join this webinar to learn more about the HPE UIoT Platform and how oneM2M addresses the challenges of fragmentation and integration complexity with a horizontal-platform-based approach. This webinar is the first of a sequence of webinars that oneM2M is hosting to highlight various implementations and deployments of oneM2M. This webinar will provide an overview of the new features and functionality supported by the new Release 2 version of the oneM2M standard. How can smart city architects plan for future scalability, integrate as yet unknown technologies while being interoperable with legacy installations? Only a standards-based solution can help address these challenges. Today we'll see how the oneM2M standard used in a smart city architecture can introduce a horizontal interoperability layer and reducing vendor lock-in. We'll learn from the experience of oneM2M in the field, taking the example of Korea's ambitious smart city project in Busan, based on oneM2M. We'll examine a blue-print for future smart city development, taking into account legacy systems, open standards, open data and security. Our presenter is Dr. Omar Elloumi of Nokia, the chairman of oneM2M's Technical Plenary. Intelligent Transport Systems (ITS) are an important subset of IoT applications. They are made possible by sharing multimodal transport information across data owners, application developers, service providers and end-users to deliver innovative services. By exposing historically closed data assets to different stakeholders, Intelligent Transport Systems deliver significant economic gains; citizens benefit through informative services; journeys become more efficient; and, a transport assets start to generate higher returns. ITS will also have a profound impact on regional economic development by fostering new business start-ups, for example. This webinar examines the intelligent-transport needs of local government and transport-sector authorities in the UK and how the oneM2M standard addresses their operational requirements across a broad set of stakeholders. Presenters from Arup, Buckinghamshire Country Council and InterDigital will describe how a public-private consortium field trial is using the standard within the oneTRANSPORT project. The pilot is being rolled out across several counties in the UK, covering a population of over 4m people. The webinar will also illustrate new application opportunities and business models for local authorities to monetize their assets including early Return-on-Investment projections for a viable, long-term deployment. •The semantic vision of IoT: from data to intelligence. •Data interoperability and generic interworking in oneM2M. •The oneM2M base ontology: concepts, properties and relationships. •How to map the base ontology with external ontologies. •How to instantiate oneM2M resources according to the base ontology. •Towards semantic discovery and advanced reasoning in oneM2M. Dr. Mahdi Ben Alaya is the founder and CEO of Sensinov. He obtained a Ph.D. in networks, telecommunications, systems and architecture from the University of Toulouse and LAAS-CNRS in France. His research interests cover IoT Interoperability, Autonomic Computing, Semantic, and Information Centric Networking. He is co-founder and technical manager of the open source project OM2M at the Eclipse foundation. He is now serving as vice-chairman of the oneM2M Test working Group. Continua is a Partner in oneM2M, and actively contributes to the development of oneM2M specifications. Discover how Continua and oneM2M specifications and standards can work together to develop better personal connected healthcare apps. Find out how Continua integrates with and makes use of the work done in oneM2M. Get the latest update on demonstrations involving oneM2M and Continua technology. This next webcast from oneM2M will fill you in on progress since the oneM2M Showcase last December. oneM2M Release 1 specifications were published in January this year. Find out what functionality is enabled by this set of 10 specifications. Discover what this functionality really means for M2M and the IoT, how it can be used, why it is necessary, how businesses focused on M2M and the IoT can take advantage of oneM2M’s work. Release 1 is out the door, but work hasn’t stopped: find out what’s in store for oneM2M Release 2, and how you can get involved. Dr. Josef J. Blanz is a principal engineer with Qualcomm’s Standards and Industry Organizations Group. He coordinates Qualcomm's participation in M2M and IoT related standards and industry fora, conducts related internal design work and serves as an interface to business development, product management and engineering teams. Josef was actively involved in the creation of oneM2M and serves as Qualcomm’s lead in oneM2M. 4th in a series of 4 webcasts introducing oneM2M, the global standards initiative for machine to machine communications and the Internet of Things. This webcast addresses how oneM2M covers Management, Abstraction and Semantics (MAS), which are the key enabling capabilities for hiding the heterogeneity and providing high level interoperability for the variety of M2M/IoT devices and applications. The topic is under the major responsibility of oneM2M MAS WG. – The common service capabilities provided as M.A.S. – The architecture design and the protocol mapping for M.A.S. – The vision and evolution of oneM2M on M.A.S. Dr. Yongjing Zhang is a Standard Research Project Lead of Carrier Software Business Unit at Huawei Technologies Co., Ltd, responsible for telco service related standard activities, innovation research as well as product planning. His professional areas include SIP/IMS, Messaging, Personal Network, Device Management, and most recently M2M/IoT and Network Function Virtualization (NFV). Among his active participation in several standard organizations, he is now serving as the chairman of the oneM2M MAS (Management, Abstraction & Semantics) Working Group. 3rd in a series of 4 webcasts introducing oneM2M, the global standards initiative for machine to machine communications and the Internet of Things. Join us for each webcast between now and end November for an in-depth overview of oneM2M, the standards it has developed, and find out why oneM2M will be key to the sustainable development of the Internet of Things! In this 3rd oneM2M webcast, we’ll explain how oneM2M handles security. Confidence in the security and privacy of data will be a key factor in the successful take-up of M2M and Internet of Things services. oneM2M is building in security from the start, rather than bolting it on at a later date. 2nd in a series of 4 webcasts introducing oneM2M, the global standards initiative for machine to machine communications and the Internet of Things. In this 2nd oneM2M webcast, let’s lift the lid and look inside the oneM2M specifications. - Requirements and use cases: where have they come from? 1st in a series of 4 webcasts introducing oneM2M, the global standards initiative for machine to machine communications and the Internet of Things. - What are the opportunities offered by the M2M and IoT markets? - What are the key challenges facing these markets? - What are the challenges facing M2M service providers? - How fragmentation and complexity is driving up costs when the opposite needs to happen? - Why has industry come together now to create oneM2M? - How standardization at M2M platform level will enable greater growth in M2M and IoT markets? - What features do the oneM2M standards offer? Marc Jadoul is Strategic Marketing Director, Customer and Market Insight, in Alcatel-Lucent, working with company-wide stakeholders to create thought leadership, generate sales opportunities and grow revenues, and engaging with senior customers to capture their needs, enhance their strategy and help them grow their business. Marc has over 20 years’ experience in the ICT sector. He is a passionate B2B storyteller, blogger, author or co-author of more than 100 papers, magazine articles and conference presentations, and a frequent speaker and panellist at industry events. oneM2M develops globally agreed-upon, access independent, end-to-end specifications for an M2M communications and management system that can be readily embedded within various hardware and software, connecting the wide range of devices in the field with M2M application servers worldwide. The project brings together fourteen of the world’s leading ICT Standards Development Organisations and industry consortia and over 200 member companies. oneM2M specifications provide a common means for communications service providers to support applications and services as diverse as the smart grid, the connected car, home automation, energy management, enterprise supply chain, public safety, eHealth and telemedicine.